Women everywhere can 'B Happy', 'B Healthy', and 'B Energized' with 1st Step Pro Wellness Vitamin B12 Complex Energy Drink! Daily stimulant use such as coffee and soda can really take it's toll on your physical and mental health. 1st Step Pro Wellness offers women a natural energy boost that is safe and effective to take daily. Not only do you get a great boost of natural energy, you also get a dose of vitamins B12, B6, and B9. The B Complex in 1st Step Pro Wellness' Vitamin B12 Complex energy drink helps in aiding metabolism and works to promote health of the nervous system and vital organs. Their 99% grade B12 used in these energy drinks helps convert food into energy without any artificial flavoring or chemicals. 1st Step Pro Wellness Products Are Available Nationwide At Walgreens, Bi Lo, Publix, Kroger, And Over 2,000 Independent Retailers! I recently took a 2 day challenge from 1st Step Wellness to try their Vitamin B12 Complex Energy Drink and share my results with my readers! I received two bottles of their drink, (1) Tropical Blend flavor and (1) Cherry Charge flavor. I was interested in seeing how B12 would work for me as far as energy goes. Up until now I have only used stimulant energy supplements and coffee to fuel me through my day. As far as taste goes, I enjoyed both flavors! My favorite flavor was the Tropical Blend. It resembles juice as far as taste goes, so very pleasant! The B vitamins contained in this energy drink really helped me to feel energized and ready to take on my day these past 2 days of using this product. I liked that I could get that kind of energy stimulant and caffeine free, providing a healthier alternative for energy. 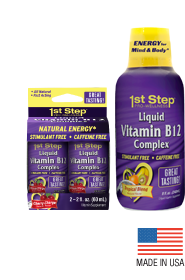 I drank one bottle of 1st Step Pro Wellness B12 Vitamin Complex in the morning for two days. I noticed a good 4-5 hours of energy boost. As a busy mom the added energy was a big plus and I would recommend this product to any woman out there looking to get a natural and healthier boost of energy! Enter The 1st Step Pro Wellness Facebook Contest! From now until November 19, 2012 you can head on over to the 1st Step Pro Wellness Facebook page here and take their Great Taste Challenge where one grand prize winner will receive a one year supply of 1st Step Pro Wellness Vitamin B12 Complex energy drink, some fun swag, and a gift card to Walgreens. One runner up will receive a six month supply of their energy drink plus some fun swag! Participants will enter by submitting a creative photo that shows what they think about the 1st Step Pro Wellness Vitamin B12 Complex drink. Winners will be notified on November 20, 2012. *Disclosure: I was provided sample products for review by the above mentioned company in exchange for my honest review. All opinions expressed in this review are 100% mine and are not a result of any outside influence.